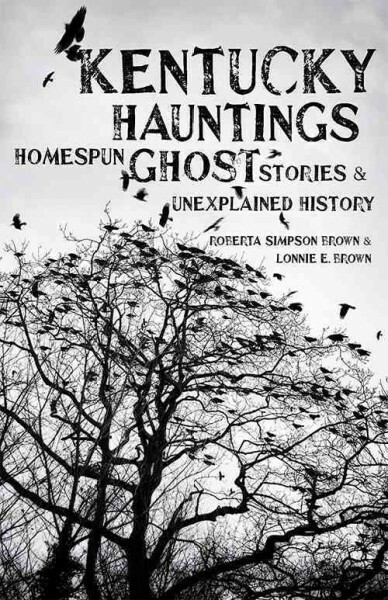 Reserve a copy of Kentucky Hauntings Homespun Ghost Stories and Unexplained History by Roberta Simpson Brown and Lonnie E. Brown today! Looking to read about ghosts, spirits, phantoms, or unexplained phenomena? Want to read a spooky story about Kentucky or one that originates in your own back yard? Do you think your house may be haunted and want to research its history? Look no further than the Kenton County Public Library. We have numerous local history books and resources filled with haunting tales, ghost stories, and documented unexplained experiences that will give you a good fright just in time for Halloween. If you’re thirsting for spooky tales from Kentucky, sink your teeth into Ghosts Across Kentucky by William Lynwood Montell or Ghosts, Spirits, and Angels True Tales from Kentucky and Beyond by Thomas Lee Freese. If you have regional supernatural interests, try Haunted Louisville: History and Hauntings from the Derby City by Robert W. Parker or Appalachian Ghost Stories Tales from Bloody Breathitt by Jerry Deaton. For local hauntings, dare to turn the pages of Cincinnati Ghosts and other Tristate Haunts by Karen Laven, or The Cincinnati Haunted Handbook and Haunted Cincinnati and Southwest Ohio by Jeff Morris and Michael A. Morris. Or, if you don’t find the truth stranger than fiction, A Vampire in Covington by Tim Kelly is a new addition to our Kentucky Fiction collection that incorporates many famous people and locations from Cincinnati and Northern Kentucky. Join paranormal investigators Zak, Nic and Aaron as they investigate the paranormal experiences at Bobby Mackey’s Music World. Also, don’t forget to read or re-read books about the widely-known Northern Kentucky haunting of Bobby Mackey’s Music World. Books in our collection include Haunting Experiences at Bobby Mackey’s by Christel Brooks, and the fictional Hell’s Gate: Terror at Bobby Mackey’s Music World by Douglas Hensley. We also have copies of the Ghost Adventures television program that investigated Bobby Mackey’s in Season 1 and Season 4. Have you experienced something you can’t explain at Bobby Mackey’s? Creep us out in the comments! The true story of Pearl Bryan’s murder in Fort Thomas has captivated Northern Kentuckians for over a century, inspiring countless ghost stories and legends. Learn more about the macabre case in The Pearl Bryan Murder Story by Anthony W. Kuhnheim and The Perils of Pearl Bryan Betrayal and Murder in the Midwest in 1896 by James L. McDonald . You can also read online newspaper accounts from the investigation and trial in the Cincinnati Enquirer – Historical 1841-1922 Database. What hair-raising stories have you been told about what happened to Ms. Bryan’s head? Leave us a reply and let us know! Do you hear bumps in the night? Here are a few basic steps for researching a potentially haunted house. Obtain a copy of the deed from your local courthouse. (This will tell you who has owned the house and more details on when it was built.) Visit the Kenton County Public Library and start researching! Use our city directories and find out more on the families who lived there. To find more information on the previous owners and the home search the Northern Kentucky Newspaper Index, geNKY and our online map collection. For more information on how to research your home take a look at our guide History at Home: Resources for Documenting Historic Houses, Structures and Neighborhoods. Remember to document all your sources and keep organized records. Do you have any unsettling stories about your home? If you’re feeling in the spirit to peruse cemetery records of your ancestors, our geNKY database contains many indexes to local cemeteries including Linden Grove, Persimmon Grove, St. John’s, St. Mary’s and Mary E. Smith African American Cemetery. In the back row: Mark Kluemper (16), Tyrone Rice (21), and in the front row: Lori Young (12), Mary Bales (18), Greg Washington (17) rehearsing for haunted house sponsored by Covington-Kenton County Jaycees on October 15, 1975. This photograph was found in our Faces and Places Database. Once you’ve had your fill of eerie tales, you might try researching a few of your own. If you fancy yourself a ghost hunter and want to learn more about people and places from the past, the library has many resources for you to investigate. The Local History and Genealogy Department’s Faces and Places Photograph Database contains many spooky images. Take a minute to search for yourself or your family members. You may be surprised by who haunts the database. Do you have any ghost stories about local places or Kentucky? Leave us a comment and let us know what spooky stories we have in our own backyard! This blog post was written by Cierra Earl from the Local History and Genealogy Department in Covington. The Kenton County Public Library is Spooktacular! I love October. I think it’s my favorite month of the year. The weather is cooler – perfect for jeans and sweatshirts. The leaves turn beautiful colors, it’s the perfect time for making smores over a bonfire, I enjoy the flavors of fall including pumpkin spiced anything, children are getting excited about Halloween and the programming at the Library is spooktacular! I love helping my kids design their costumes and decorating my house and yard. “How to Create Spectacular Halloween Costumes” by Louann Brown,” Paper Crafts for Halloween” by McGee, Randel and “Haunted House Adventure Crafts” by Anna Llimos Plomer are great books to assist with decorating and costumes. Having Zinio online has made cooking, decorating and making costumes even easier! Zinio is an online service available through the Library that offers thousands of magazine subscriptions for free. I love “Taste of Home Holiday,” “Family Circle,” “Country Living,” “Parenting” and “Women’s Day” for holiday ideas, recipes and more. The Library offers great fall/Halloween programs this month – all for free. There is a Haunt Your Library contest taking place at the Covington Branch Library for grades 1-6 until October 10. Winning stories will be featured in The Recorder Newspaper and prizes will be awarded. The Halloween storytimes are definitely the cutest thing we see all year – babies in costume! The Boo Bash, Octoberfest and Pumpkin Carving Party are sure to be a good time. The Haunted Library at the Durr Branch on Friday, Oct. 26 and Sat., Oct. 27 promises to offer thrills, chills and laughs. This is suggested for those 6 and older. The Durr Branch has a few Dracula themed events this month as well as a presentation by the Paranormal Investigators of Northern Kentucky. Teens can create Eerie Earrings at the Erlanger Branch. Learn more about programs and register at the www.kentonlibrary.org. If you are looking for a good scare, you might want to check out one of Alvin Schwartz books like “Scary Stories to Tell in the Dark” or “More Scary Stories: Tales to Chill Your Bones.” “Haunted Kentucky: ghosts and strange phenomena of the Bluegrass State” by Alan Brown or “Tragedy at Devil’s Hollow: and other haunting tales from Kentucky” by Michael Paul Henson might be interesting to the adults looking for a scare this October. You can search the Library catalog for more ghost stories, e-books, music and more. 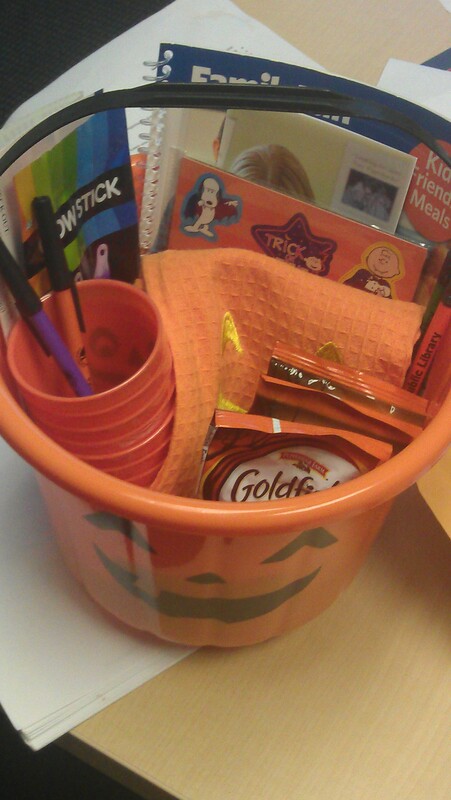 In honor of my favorite month, we will be giving away a Kenton County Public Library Fall Prize Pack. To enter, you must do at one of the things below. Doing all four gives you more chances to win. The contest ends at noon on Monday, Oct. 8. Comment here telling us what your favorite fall program is at the Library. Subscribe to one online magazine through Zinio and comment here that you did. Follow the blog by clicking “follow” in the upper left hand corner. Post a photo on the Library Facebook page of you or your child in their Halloween costume or their favorite Halloween/fall themed book and comment here that you did. Be sure to do each entry separately for more chances to win. Winner must be able to pick prize up at one of the Kenton County Public Library branches. Be sure to include your first name and email. Library employees and their immediate family members are not eligible to win.